It’s the cute flower boys of summer! 100% are back again with a 180 degree shift in concept. Their last mini album “Bang the Bush” and MV ‘Beat’ featured loads of vampire / frankenstein imagery (plus abs – yay! and lots of rather hot stage outfits featuring leather). ‘U Beauty’ is ALL about being adorable and piling on the aegyo. I’m not complaining though, as I love and adore cute concepts – especially cute concepts with colourful hair! There’s a glut of adorable MVs out at the moment – which are all celebrating the northern hemisphere summer (as I type this, there’s a thunderstorm outside and I have my electric blanket dialed up to “3”). This MV isn’t anything super different, but it’s fun to watch and the song is very catchy! 100% have gone for a fresh and cute idol concept as they sing to a pretty girl (and slightly stalk her in the locker room). 100% are currently promoting as a team of 5. Their very attractive leader Minwoo is in the army and the maknae Sanghoon is on a break as he decides what he wants to do. Rokhyun has taken over leadership duties and is currently making himself my bias because he’s just too sweet. These boys are label mates with Teen Top with Top Media (yay!) and it’s fantastic to see them promoting back to back. They’re very underrated as a group and I’m hoping that they’ll continue to build their fanbase and popularity so we can see more of them! I love the vocal line in this group – they are all talented singers and this is a light summery song with a good hook line ‘니가 예쁘다’ (niga yeppeuda) which will worm its way into your brain and have you singing along. I like the brass elements too – overall the song is bright and cheerful and has a fun rap chorus too. I have to mention the colourful hair too! Jonghwan is blue, Rokhyun blond, Changbum pink, Chanyong is orange and Hyukjin escaped the stylist this time! I also appreciate the choreography – it fits well with the song, and has some pretty well executed moves that put their athleticism and flexibility to the test! I like that there are some jazz ballet moves too! The live stages have been a real treat to watch so far as well with their strong vocals coming across. I have embedded the original and dance version MVs below (The dance version is my favourite because it’s really good!) and if you have time you should also check out the acoustic piano version because it’s AMAZING! All the harmonies!! *melts* These boys are so talented! The best kind of birthday present is one that you give to yourself. Japan K-Pop releases in early July just happened to have the best ever combination of groups releasing within days of each other, so I bundled them together into one delivery of awesome! I buy my Japan K-Pop through HMV – not only do they have an extensive and thorough catalog, their shipping is SUPER fast and always supremely well packaged. I’ve never had a bent or damaged CD yet. They might be slightly more expensive than CD-Japan, however I earn a lot pf points with them that I redeem to cover the shipping of subsequent orders… This is how my never-ending stream of deliveries is justified… Japan is bankrupting me I swear! So yes, I absolutely bought all versions of SHINee and Infinite and restricted myself to just one of VIXX (though I am now VERY tempted to add the group version to another order). Apologies for the photos – it’s late at night and I’m working at the moment. Boo having to earn money to fund this addiction! Also known as the cutest single EVER! 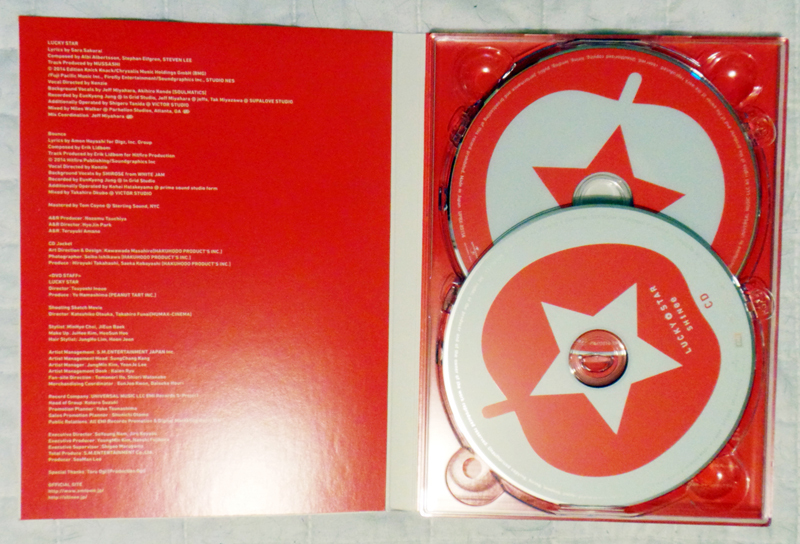 The standard edition is a CD-sized album. 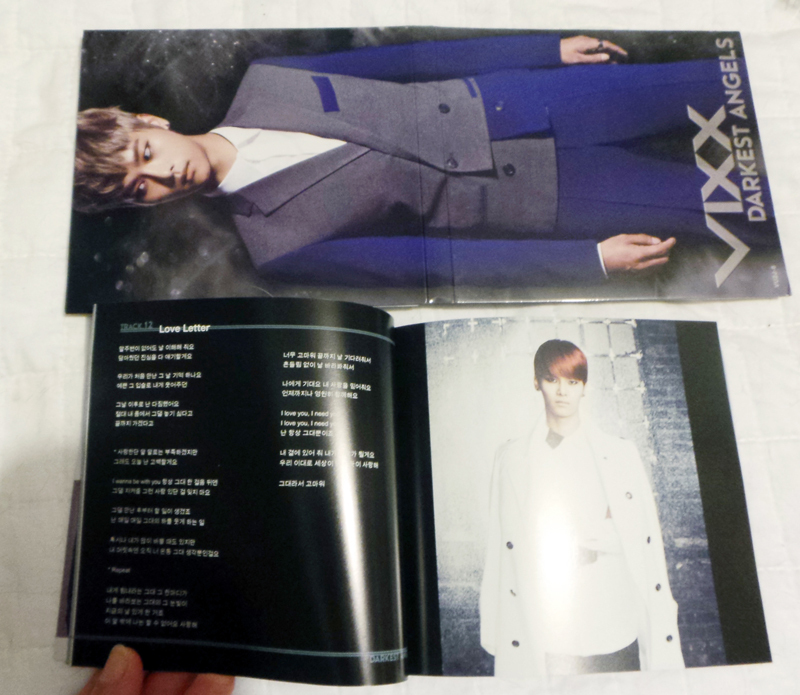 It comes with a photocard (1 of 6 random) and postcard (1 of 6 random). 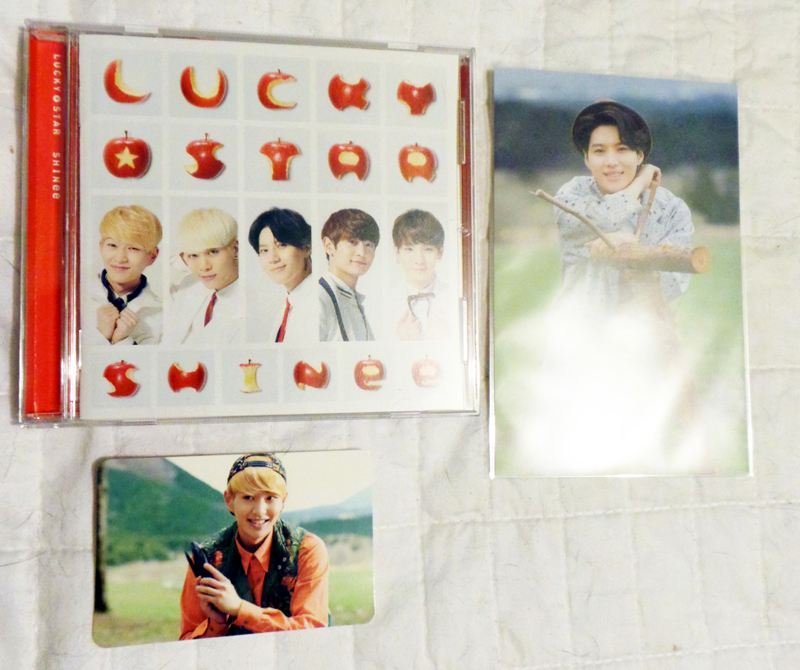 I got Taemin and Onew! Inside is a small photobooklet with 12 pages of images and lyrics – it’s head shots of all group members posing super cutely and some group shots as well. For those wondering – YES they are different to the Limited Edition. This was seriously so adorable! The limited edition is a DVD sized release with a perspex slip cover (printed with stars – sooooo cute!). 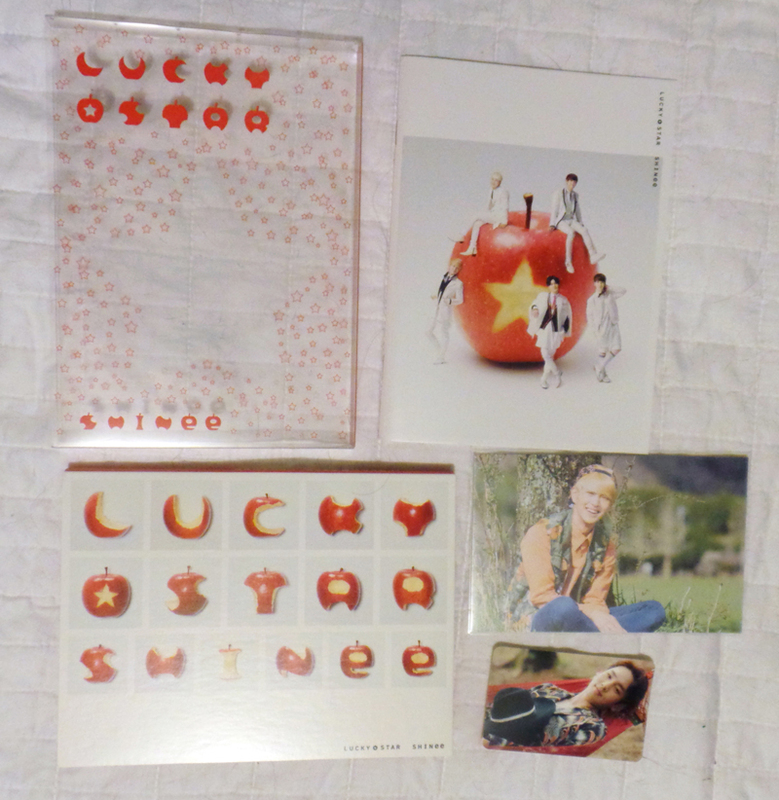 It also comes with a postcard (1 of 6 random) and photocard (1 of 6 random). I got Onew and Key! 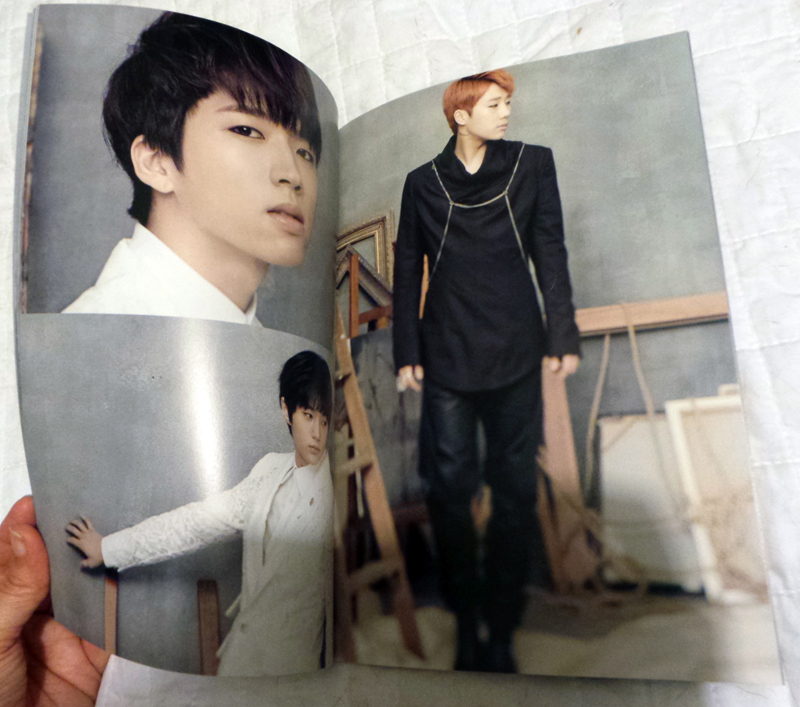 Inside is a 28pp photobooklet and case with a CD and DVD. 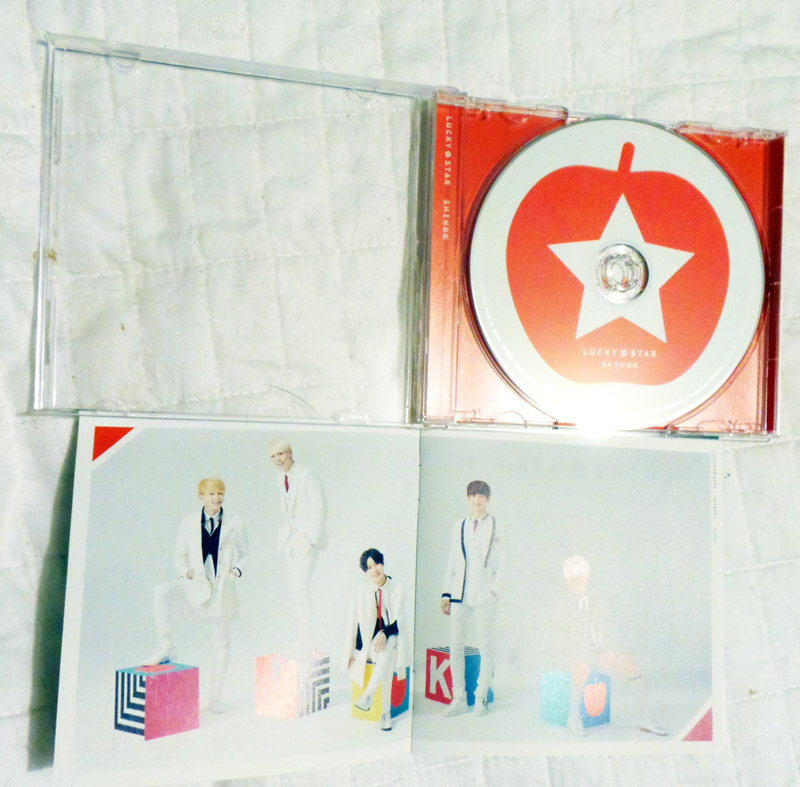 The CD has the single ‘Lucky Star” and B-side ‘Bounce’ and the DVD has the full PV (yay!!) as well as a super adorable ‘making of’ featurette. This is not subbed in English, but you don’t really need a translation! This is a square album – slightly larger than a standard CD. It has a clear perspex slip case, CD/DVD case and 52pp booklet that has images from several of their Korean photoshoots for previous albums. 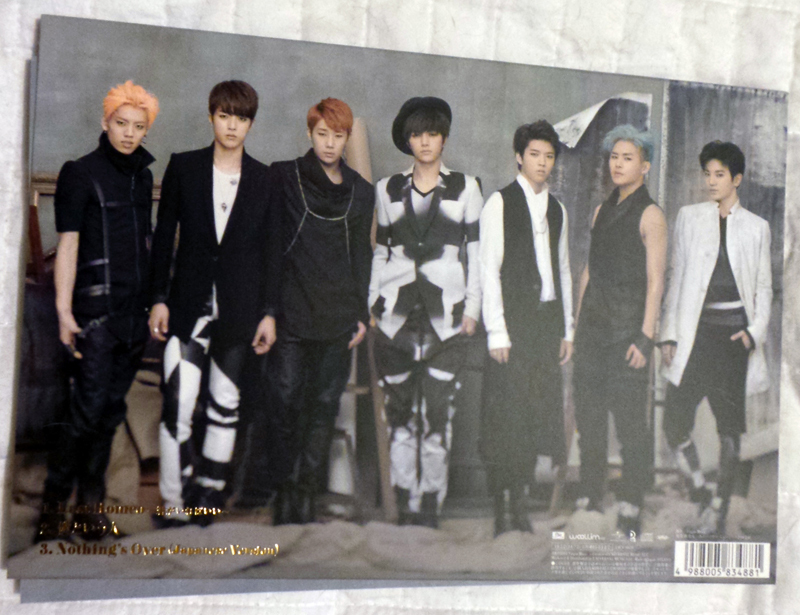 It also came with a group postcard as well as a photocard (1 of 6 random). 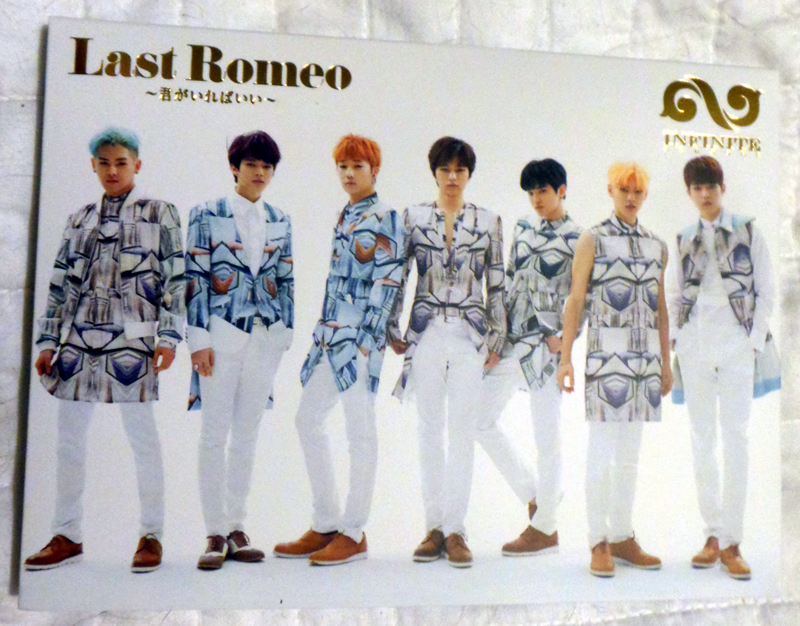 The photocard is the larger ‘Japan-size’ which juuuuust squeezes into a photo holder. 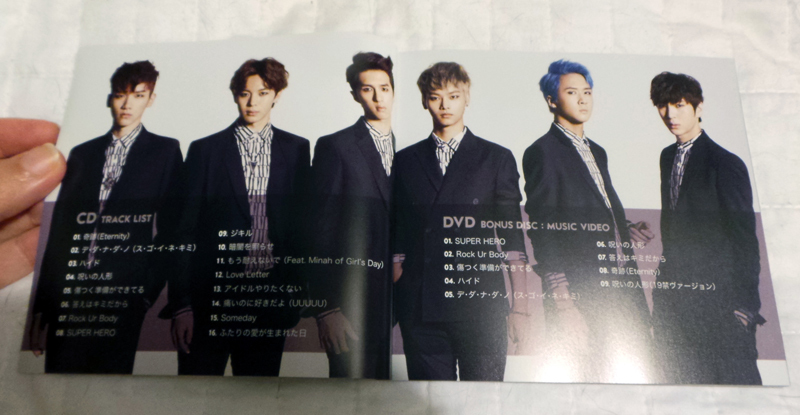 This is a full album with 16 tracks and the DVD contains 10 MVs (all Korean versions). 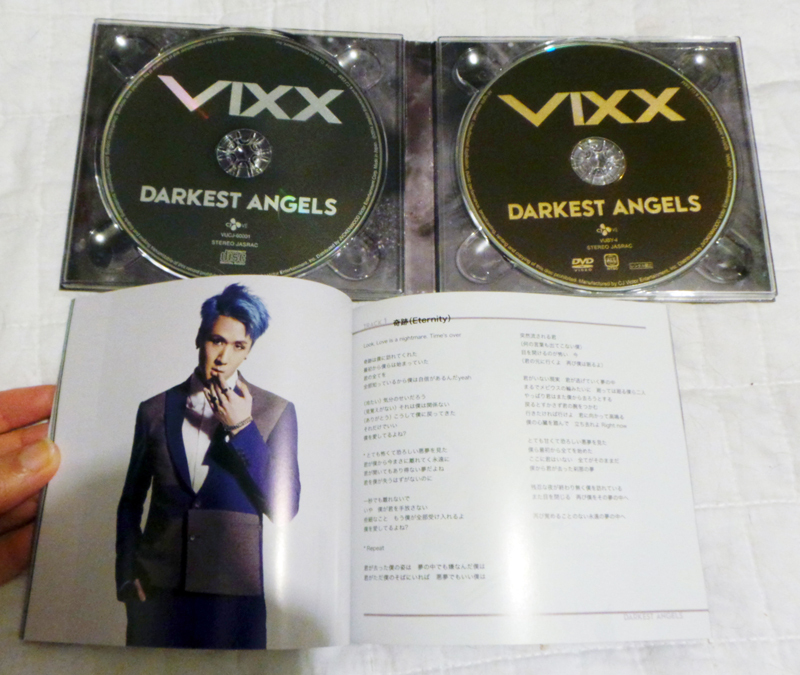 This is an album release purely for the Japanese market – VIXX have not re-recorded their songs in Japanese, so there’s nothing new here. This is really only worthwhile if you like collecting! 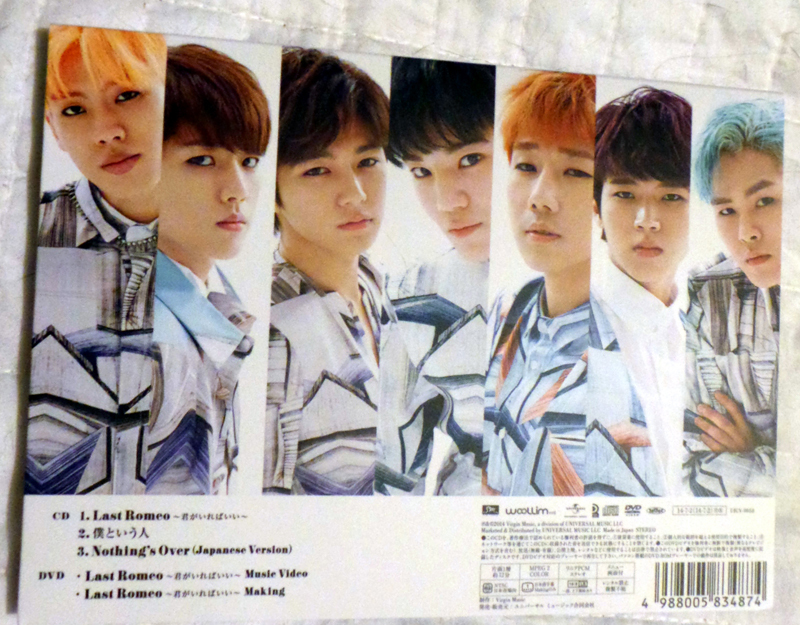 The Infinite albums are all exceptionally presented! 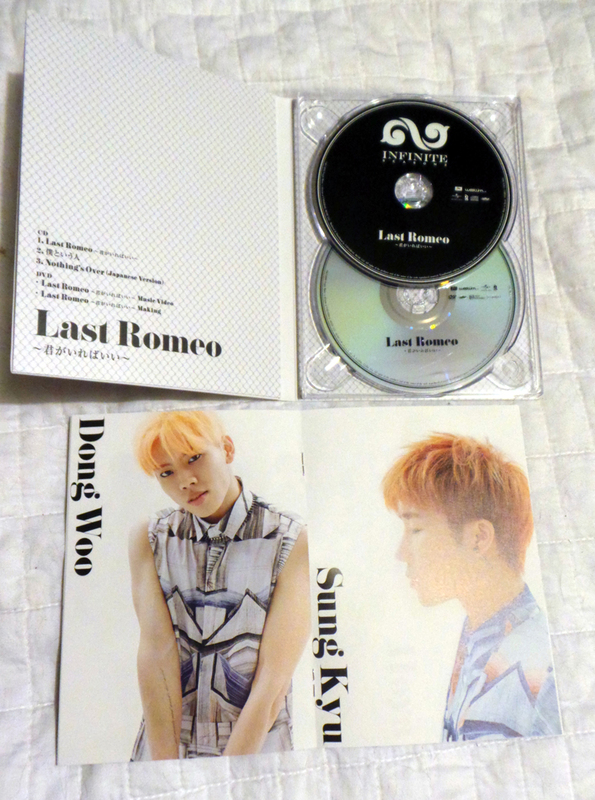 The standard edition has a slip cover that has foiling and also comes with a photocard (1 of 8 random) I got Hoya! 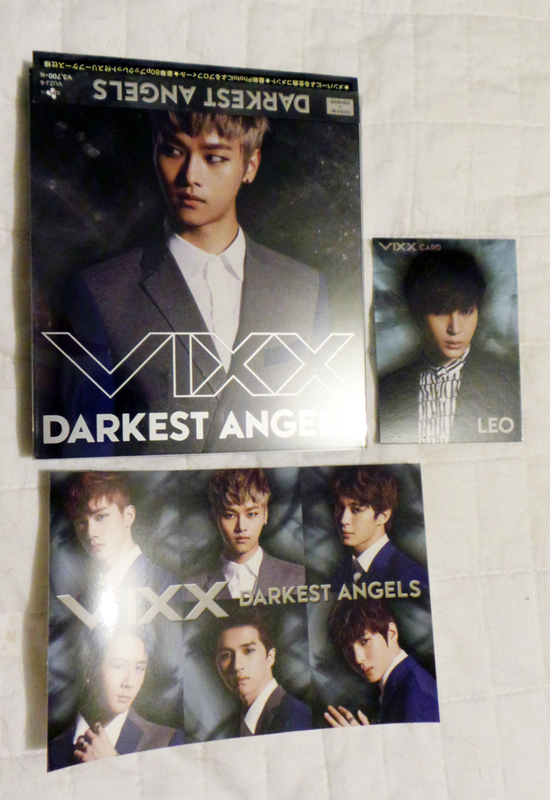 Again these are the larger type photocards. Suuuuuper pretty!! 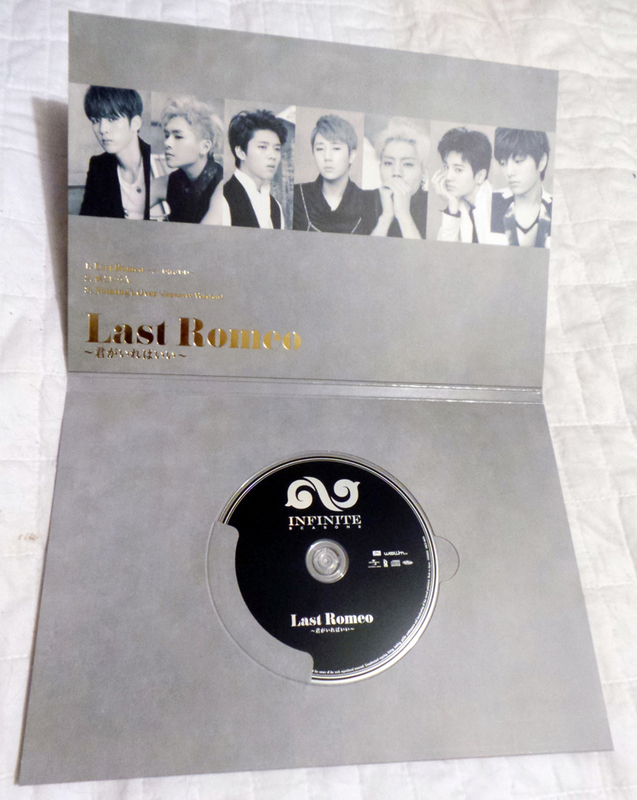 It’s about the same size as a DVD and comes with a 16pp photobook as well as a CD / DVD combo. 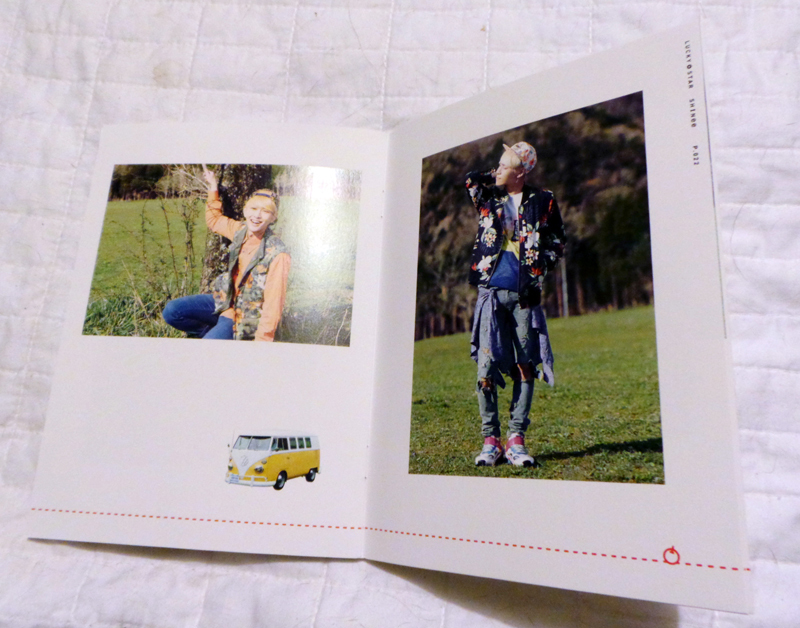 The photobook slides into the left hand side and is hidden. These photos are of the Japan outfits from the MV remake! Edition B only has the single, but the 52pp photobook is absolutely gorgeous! 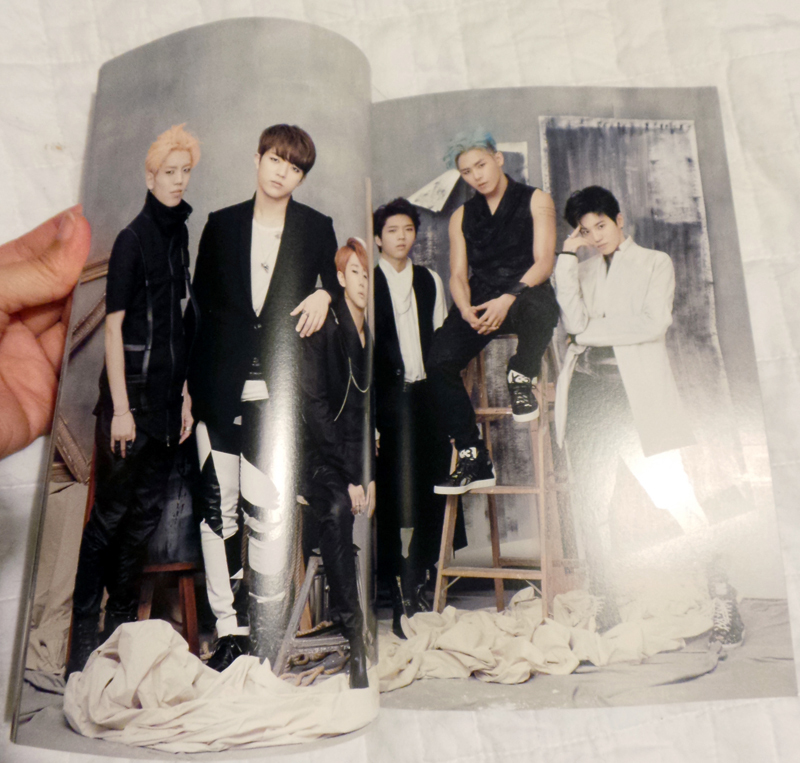 This is from the same photoshoot as their second Korean album and it’s a very high quality print with lovely paper. This is me – literally dying from happiness and glee! The MV and song are a perfect summer pick-me-up; it’s a fresh retro sound – with a bit of 70’s synth along with all of the oversaturated and bright colours. It’s definitely very ‘pop’ but still sounds like SHINee! This is the follow up to last summer’s ‘Boys Meet U’, so our boys are out hot air ballooning and preparing food for some sort of picnic / camping holiday – IDK but it’s adorable. I love all the cute outfits as well – it’s very Dream Girl-esque. Right out of the gate, this is upbeat and fun – please note that not only is Taemin wearing a cape, but he manages to dance in it as well. Key actually opens the song as well! The whole dance looks pretty cute actually – this should be pretty fun to see live in concert. Seriously this is ridiculously adorable – and now I want to go ballooning with SHINee 주세요! Onew is seriously a giant loveable dork and I can’t even deal with him right now. Aimee, your ultimate bias just kills me sometimes – I mean look at this!!!! Bonus Minho FAILING at being a handyman back there too. Apparently Jonghyun Can Nail Things! (Including me!) No but seriously, kekeke! Please note that Onew is totally still struggling to cut up those vegetables in the background there! Even with a cute pastel bug keeper – eww no! But Taemin is having NONE of that. Sidenote – how cute are these tents with all the bunting and pretty colours. SHINee go camping in style! Awwww! *squishes him* And it synchronises with the lyrics too! And Key throws a heart at us too, just to make me love him a little bit more. He really kills me. 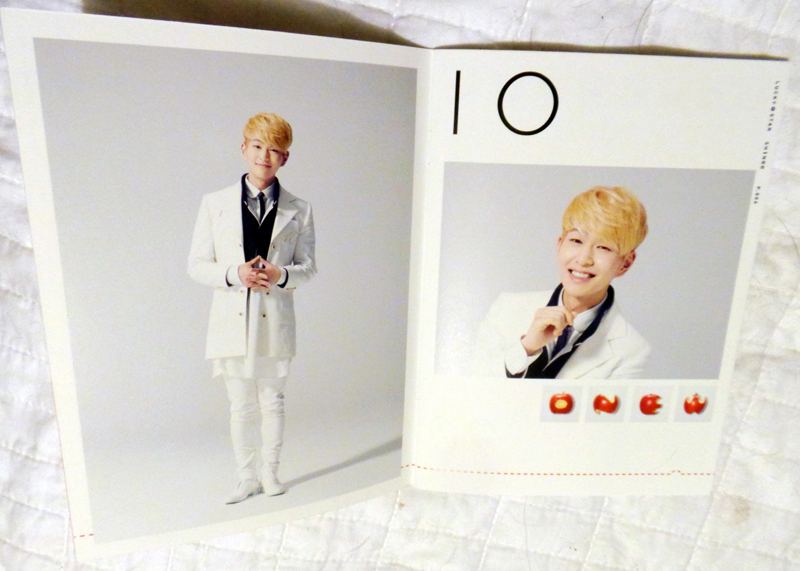 *ugly sobbing* You had better not be any cuter Onew, or I will steal you for myself! *more ugly sobbing* Why are SHINee so adorable? I just love them all too much!! And the anniversaries just keep coming! Today is Boyfriend’s 3rd year anniversary. May and June are definitely debut months for Kpop – I have so many dates marked out in my calendar. Now that we have started this ‘tradition’; we also watched all of Boyfriend’s super cute MVs tonight – both Korea and Japan releases. There are so many super cute videos! This group has a very sugar sweet concept – with loads of aegyo and adorableness – you might just expire on the spot from too much smiling. It amuses me that their fanclub is called ‘Bestfriend’ and not ‘Girlfriend’ – friendzoned right from the start!! Apart from the cuteness, I do like all of their songs as well. 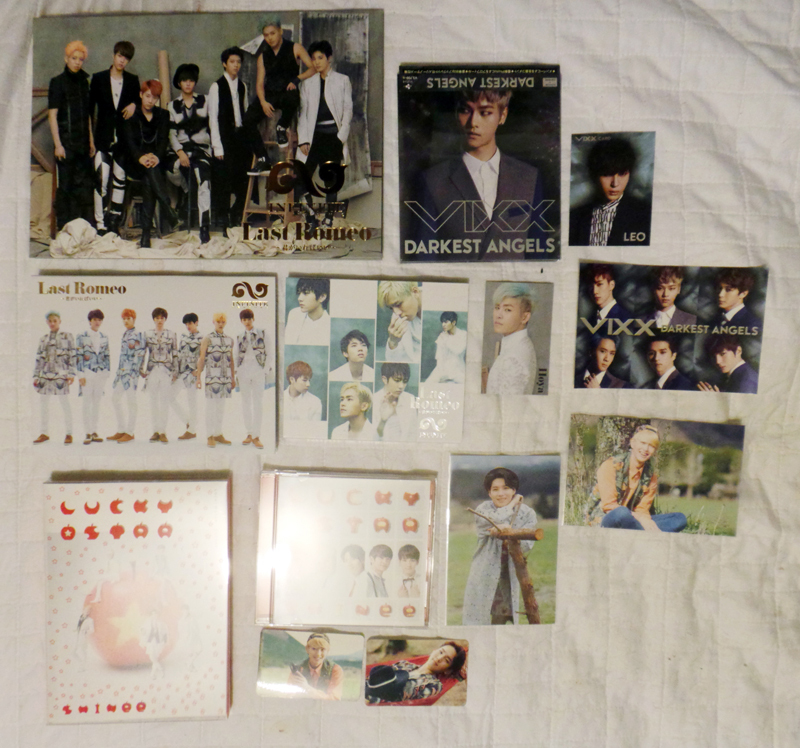 I bought most of their Korean albums in Korea and have since added all of their Japan ones as well. The only one I’m missing is ‘Janus’ – as I have the repackage ‘I-Yah’. I resisted this group for quite a while – but cutie boys are my weakness. 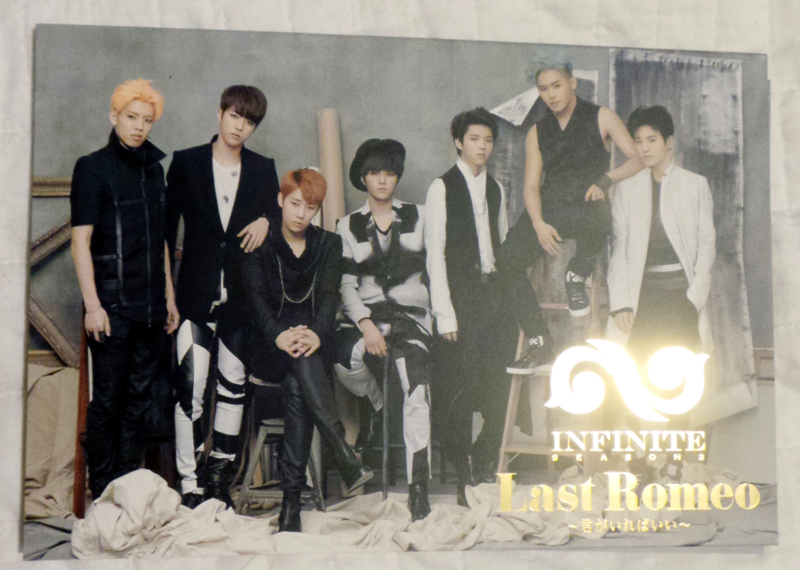 Plus… they are totally the Korean version of Ouran Highschool Host Club. Their comeback for Korea is scheduled for next month! I’m really hoping that they finally crack the Top Twenty. They’re very successful in Japan, but haven’t promoted in Korea for a while. Love Style – This album is just filled to the brim with the most adorable photos – all the cute pastel suits! This song is very catchy and is full of so many of Boyfriends ‘signature’ elements. It has a cute dance and a lot of smiling at the camera. Dance Dance Dance – Cute boys, puppies, magic wardrobes! AISH! Hehehe. Well MCountdown was a lot of fun tonight, and we live watched it online together with our chat window open so we could squee at appropriate moments! 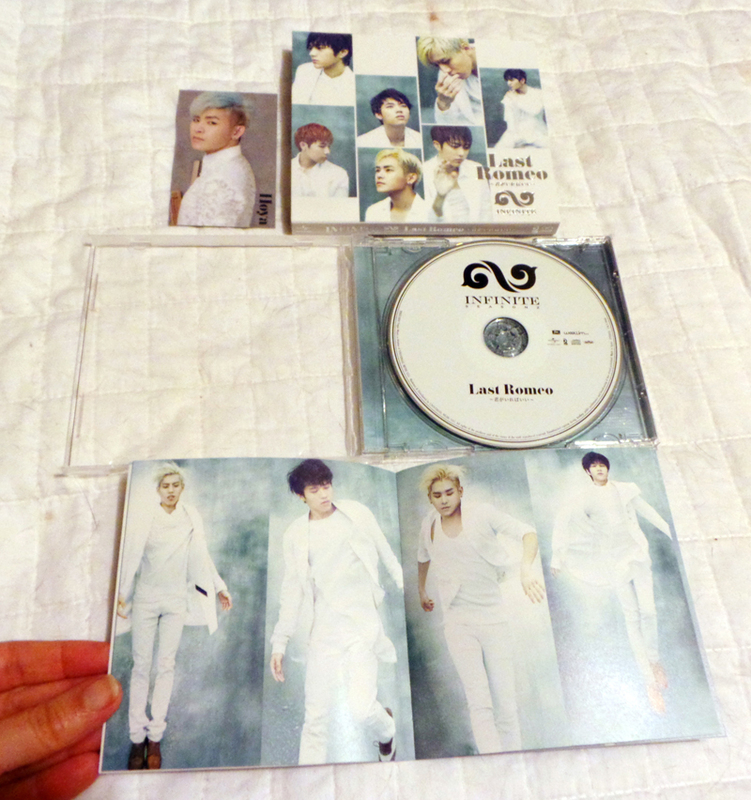 I particularly enjoyed the comeback stage for Infinite – which was amazing and perfect! My shuffle likes the song too, so the more I listen to it, the more I like it. There are some great vocalists in this group. My gateway drug to Kpop! Thanks Hong Ki! So really, “You’re Beautiful” is to blame. Hong Ki (from FT Island) and Yonghwa (CN Blue) had supporting roles in this drama (and sang the OST as well!). And because we liked the songs in the drama so much, it wasn’t too much of a leap to then investigate their music as well. For about a 3 month period, all I listened to was FT Island, CN Blue and OST’s from various dramas. Then we discovered Super Junior and SHINee and a few others (I may have totally downloaded ALL of UKISS and DBSK/TVXQ on my lonesome)… then we totally watched ALL the SuJu variety at one memorable New Years and at that point were fairly obsessed. Then later, after successfully brainwashing Emily, Aimee gave me her collection of crack (aka Infinite and ALL the boy bands) after we went to CN Blue in Sydney. I was at this point holding out stubbornly *in denial* and only watching dramas, certain that I had all the Kpop I could possibly need. But then I listened to the Teen Top and well… gave in to cutie boys which lead to several buying sprees online and by the time we went to Korea my album wishlist was 65 albums and counting. (LOL totally bought over 85, when I had intended to buy 35 tops!). Which is a very roundabout way of saying that I absolutely love and adore FT Island. My playlist (narrowed down) has 86 songs on it *despair* because they are one of the few groups where I will just wholesale add an entire album, because every single song is fantastic. On our trip to Korea, we saw FT Island live in concert for their very special 6 year anniversary. The concert ‘FTHX’ celebrated with their new album, as well as several of their Japanese songs translated to Korean (I just about cried with happiness at this). We had an amazing night and if you squint very very hard at the DVD of the concert you might be able to make us out on the first floor balcony… (also HAHA we were totally interviewed by the Korean News Media as token foreigners. “FT Island 사랑해요 *cue cheesy heart signs from 3 obsessed fangirls*”). 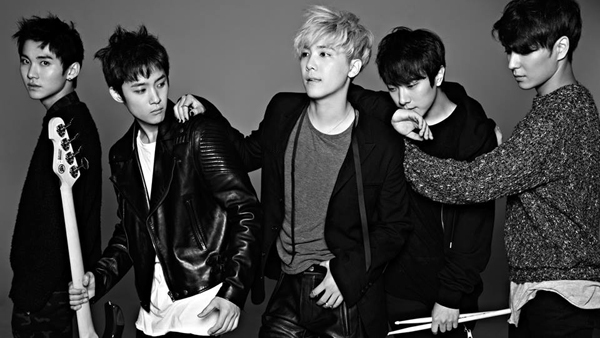 FT Island have A LOT of albums and singles and are an actualfax band – in that they play their instruments! So in addition to having great songs, they’re also super talented. They’re also the very definition of a Flower Boy Band! 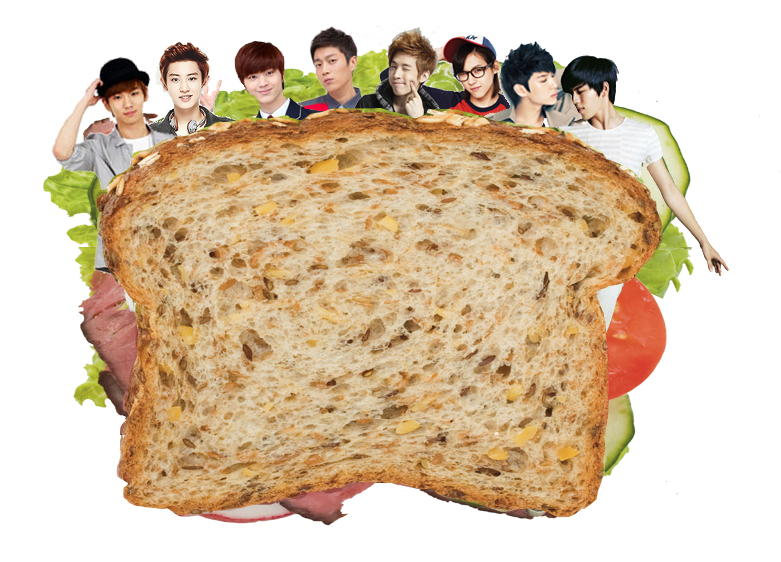 The band name in full is actually “Five Treasure Island” because their CEO is on crack. They’re currently (in 2014) destroying their image on FNC’s reality program ‘Cheondgdamdong 111’ along with label mates CN Blue. It’s a fun program to watch! 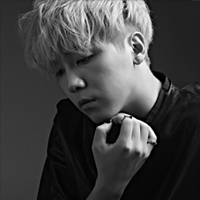 Fun Fact – Hongki went through a hair phase that can only be described as… not good, terribad, mullet with a side of how-about-no. There was much wailing & gnashing of teeth between us as we mourned for the cute hair that is ‘Five Treasure Box’. To the point where we joked, that if we happened to run into him, in an elevator in Seoul we would totally hold him down and do the world a favour with an impromptu hair cut. Alas… it was not to be – but at least it was confined to a ponytail for most of the concert. At one point we may have joked that we would celebrate with cake on the day that he cut his hair. And thus, our cake for birthdays / memorable occasions tradition was born. +10 hotness points for piano playing 🙂 *melts* I may have had a fangirl meltdown at the concert when he had the piano solo for ‘Severely’. I totally died when I spotted his cameo in the KMovie ‘You’re My Pet” – hehehe so cute! Well I could listen to Hongki all day – and frequently do – that playlist is only 6 hours or so long… He’s also stealing my heart a bit in his drama role in ‘Bride of the Century’ because he does the cutest ever pout face. Some of my favourite FT Island songs are the ones featuring Jaejin- he just has a really sweet voice that offsets Hongki perfectly. 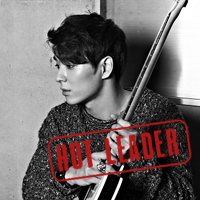 Seunghyun I don’t know much about! 미안해!! but he is excellent eye candy 🙂 No – wait! He was totally in ‘Maknae Rebellion’ and was awesome! Technically the maknae! Awwww good thing he’s also a total cutie boy drummer. 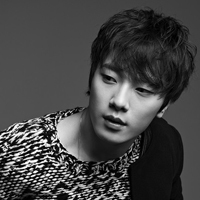 Minhwan also has a great singing voice – and has appeared in a few musicals. 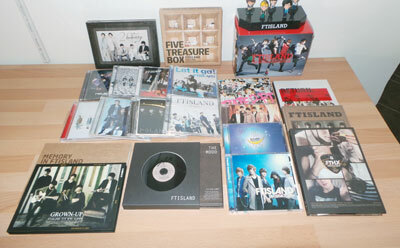 FT Island release in Japan and in Korea in both languages. I absolutely CANNOT narrow down any kind of top 10 for MV’s or songs *has nervous breakdown*, so instead will direct you to their YouTube playlists which play from their most recently released songs backwards. You won’t regret listening to them all… it’s only like 3 and a half-ish hours out of your life! 바래 (I Hope) – aish so cute!! Time travel and a super catchy song! “You Are My Life” Sooooo much love for this song. Jaejin’s accompanying vocals are so sweet and Hong Ki puts in an emotional performance. Well, I am on a mission to collect them all – however there are quite a few that are out of print and thus SUPER expensive to track down in mint or near new condition. I am only missing 10! (OMG that’s a lot to go still). 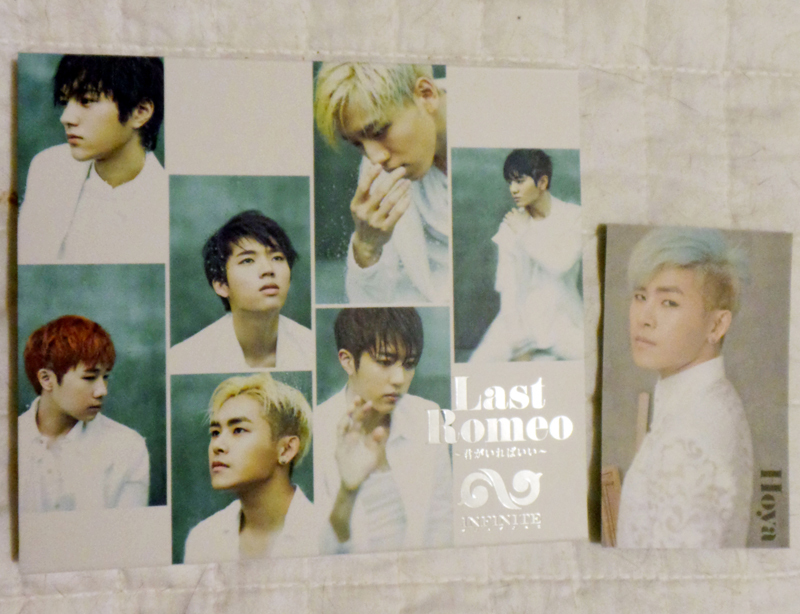 My Japan singles are all version B – so they come with a DVD rather than a photocard. The DVDs are fantastic, as they usually have the full PV as well as a concert performance.